Dr. Keller is an orthopaedic trauma and post-trauma reconstruction specialist. Dr. Keller’s practice focuses on the care of acute traumatic injuries, including polytrauma, periarticular fractures and pelvic and acetabular injuries. In addition, she treats the complex sequelae and long term disabilities associated with these injuries, such as non-unions, malunion, functional deficits and pain. Dr. Keller received her medical degree from the Columbia University College of Physicians and Surgeons in New York City and completed her residency at New York Presbyterian Hospital-Columbia University Medical Center. She completed her trauma fellowship training at the renowned RA Cowley Shock Trauma Center in Baltimore, MD. Dr. Keller is Board Certified by the American Academy of Orthopaedic Surgeons (AAOS), a member of the Orthopaedic Trauma Association (OTA), The Foundation for Orthopaedic Trauma (FOT) and Orthopaedics Overseas (HVO). 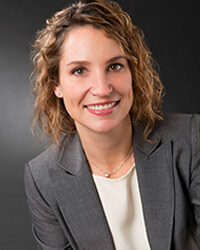 She is a faculty member of AO North America, a trauma society dedicated to the education of orthopaedic residents and the advancement of fracture care, and a course instructor for the AAOS, OTA and FOT. Dr. Keller also enjoys teaching residents and colleagues at seminars and labs and is dedicated to orthopaedic education and care in underserved areas. She travels abroad with Orthopaedics Overseas as often as she can, most recently to Moshi, Tanzania. Dr. Keller is a native of Des Moines, Iowa, and outside of work she enjoys running with her dog, cycling, pilates, traveling and cooking.